What are some of the attributes of a good survival knife? There are many things to look for, and popularity may be one indication. The best selling knife in the world is the Bear Grylls Ultimate survival knife – but does it live up to its sales statistics? Is this the best knife for your survival needs? Everybody who watches survival shows on TV knows Bear Grylls, and if you’ve been to a department store, chances are you’ve seen his line of survival gear. Gerber now makes the Ultimate Survival Knife with a fine-edge from the top of the handle to the tip of the blade. There were some issues with the first series that came out two years ago, but the upgraded Ultimate model has apparently dealt with them. I have received several requests asking for opinions about the new knife. So here we go. On first blush, the knife has some features I like, such as the full-tang, five-inch drop point blade, a soft, easy to grip handle, and a ferrocerrium rod that fits in the sheath. 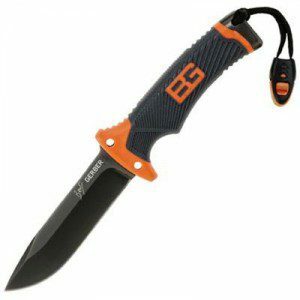 It has a bright orange trim on the handle, which is important on a survival knife. People concerned with concealment can always cover the orange with camouflage duct tape. High Carbon Stainless Steel Drop Point Blade. Gone are the serrations. People either love or hate serrated edges, and I hate them. IMO, serrations are a specialty edge that most people won’t need or use. When they dull, sharpening serrations takes skill and a specialized tool. Ergonomic Textured Rubber Grip – Maximizes comfort and reduces slippage. Thanks goodness, there was no hollow handle full of junk! A non-slip handle is a requirement for a knife that will be used in hunting or survival situations. Dress out a big game animal, and you will inevitably get blood and other fluids on the handle. If your hand slips onto the blade, it could be really, really bad. Stainless Steel Pommel – At the base of handle for hammering. In some 40 years of kicking around the back county, I have never had occasion to pound on something with the pommel of a knife. Pick up a rock or stick to do any hammering. Don’t risk your knife. Emergency Whistle – Integrated into lanyard cord. This is loud and handy, as it should be. I always carry a couple of whistles, and this feature is valuable. Fire Starter – Ferrocerium rod locks into sheath, striker notch incorporated into back of knife blade. This is a good addition to any survival knife system. Nylon Sheath – Lightweight, military-grade, mildew resistant. Land to air rescue instructions – These are things you should learn or already know. Having a reminder along on the back of the sheath is not a bad idea. Diamond Sharpener – Integrated into sheath for on-the-go sharpening. Priorities of Survival – Pocket guide contains Bear’s survival essentials. I chopped some carrots and cut up and disjointed a chicken, and sliced some steak. No problem, and it held its edge. The handle is comfortable and non-slip. Then I cut up some corrugated cardboard, one of the most abrasive and knife-dulling materials imaginable. The edge held up OK. I cut the cardboard until the blade lost its razor edge, then touched it up with a butcher’s steel. A few swipes restored the blade to its former sharpness. Next, I whittled on a hard, old pine stick until the knife started to get hard to use. It didn’t take long for the edge to lose its sharpness. IMO, it dulled too easily, which would indicate an inferior or too-soft steel. Then I tried the ferrocerium rod with the specially-ground part of the blade. Ignition sparks were quick and sure. The ferro rod is top quality, and it throws a hot spark. There is a diamond sharpener on the back of the sheath. It works fine, but it takes skill and practice to use such a sharpener. The carrying loops on the back are too small for most belts, and it doesn’t look particularly sturdy. The plastic part of the sheath appeared well-designed – all it needs is a better holder or platform. Survival instructions: These are a collection of myths and misinformation. Some of the skills shown are way beyond a beginner to intermediate’s skill levels, and trying to learn and implement some of them during a survival situation is a recipe for disaster. Overall, I’m lukewarm about this knife. It relies too heavily on Bear Gryll’s celebrity and too little on sound design and quality. While it’s not a bad knife, it is just not a very good knife or something I would stake my safety on. Do some tweaking – then you will have a quality product you can be proud of. 11 Comments on "Review: The Bear Grylls Ultimate Survival Knife"
I click on it and it goes to google maps! Although it is a Gerber knife, I have to doubt the reliability of a celebrity-sponsored “Ultimate Survival Knife”. I do know the LMF-2 won reliability awards fairly recently, so if I had to have a Gerber knife that would be the one. The link seems to be working fine from here? Link went straight to the review, which gave a final opinion I more/less expected. I took this knife on a Moose hunt and was very disappointed. Given, Moose hide is very tough and the hair on the hide very thick and a knife will dull quickly cutting it. However, I had to touch up the blade three times just to get the belly open. I tried prying apart a joint in the pelvis area and bent the tip of the blade. I used another knife to finish the job. When I got home, I put the blade into a vise and gently tried to bend it back into shape. It broke off on the first bend. The metal on the inside of the blade had what appeared to be a lot of crystals. Gerber did honor the warranty and ship a new one quickly so I cannot fault them on customer service, but I believe the knife was made in China and the blade reflects that. As mine had serrations in the blade, it may have been one of the older models, but I can only relay the experience I had with it, older or newer model. I would add that I also bought the Bear Grylls Prang, which was recalled due to the metal snapping off near the handle. Their steel seems to be problematic with the Grylls line of edged objects. @Jim – wow it most surely should not have done that – I’d get a real hunting knife, these “survival” knives aren’t really cut out for the wilderness.